Your sword bag is empty! Absolutely love the craftsmanship with this custom piece. Swords of Northshire was wonderful to communicate with. Always very timely and extremely accommodating. Listened to every detail I was looking for, and did their best to make my dream (and the recipient of this sword's dream) come true. I would and will definitely be back again to re-order another in the future. 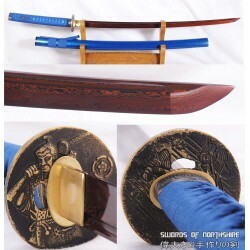 The sword is forged and assembled very well, very fast shipping, great service and courteous. Anyone who wants to buy a sword, this is the place! Impressed by their professional approach. They were quick to respond to my questions and give offers of assistance. 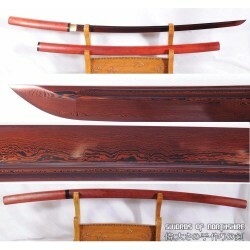 The custom made Katana was a true beauty and I am very satisfied with every aspect of my dealings with them. I can highly recommend Swords of Northshire to anyone seeking a finely crafted excellent quality sword for a very reasonable price. Our son was absolutely speechless when he unwrapped the sword. He loves it. We needed a rush build and the sword came on time. It looks very elegant-well made with handsome parts. Also, customer service was very helpful. Thank you very much. I am extremely satisfied with Swords of Northshire. Aside from my custom katana being absolutely beautiful and well made, their customer service is outstanding. They accommodated me at every step. My second custom katana is in the mail now! Can't recommend them enough, and will certainly be doing more business in the future. The quality in craftsmanship of the sword I had custom made is impeccable. The materials are beautiful. The staff were always available when needed and very informative. Folded steel blades, commonly referred to today as damascus steel or pattern-welded steel, are made by hammering the steel flat and folding it on top of itself repeatedly to create several thousand layers of steel. Most of our blades are folded around 13 times, creating 8,192 layers. Folding was done in feudal Japan since the material they used, tamahagane, was impure and needed to be folded to remove impurities and even out the carbon content of the steel. Nowadays modern steel is pure and folding is only done for tradition's sake, and for the aesthetic of the beautiful flowing grain pattern it creates on the blade. We carry a large range of folded Damascus steel swords, including katanas and ninja swords. Each of our swords is handcrafted with the highest attention to detail. 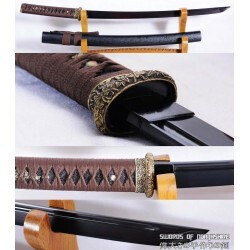 Whether you are looking for a samurai sword or want to make your own custom sword – we have the right blade for you. Build Your Own Functional High Quality Katana Your custom-made katana begins its l.. This is a well-made colorful folded steel sword, following the traditional Japanese process. The bla.. This is a well-made folded steel Katana, following the traditional Japanese process. The blade is ve.. This is a well-made colorful folded steel sword, made to resemble a ninjato. The blade is very sharp.. The black blade is made of 1095 high carbon steel and the red blade is made of folded steel. After s.. This is a well-made folded steel Shirasaya, following the traditional Japanese process. The blade is.. This is a well-made folded steel Ninjato sword, following the traditional Japanese process. The blad.. 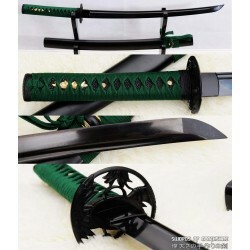 This is a set of two high quality black folded steel ninja swords that fit together into the in.. This is a well-made folded steel Katana, made to look just like Rukia Kuchiki's Zanpakuto sword from.. This Gyaku-Kobuse tanto is constructed with two different kinds of steel, folded steel (8,192 layers.. This is a well-made colorful folded steel tanto, following the traditional Japanese process. The bla.. This is a well-made folded steel Katana, made to look just like Ryu Hayabusa's Dragon Sword from Nin.. This is a well-made folded steel Katana, made to look just like Michonne's Katana from The Walking D.. 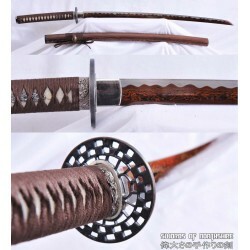 This Katana sword is made of folded and clay tempered steel with a polished mirror-like su.. This is a well-made folded steel sword, made to look just like Michonne's Katana from The Walking De.. This is a well-made folded steel Wakizashi, following the traditional Japanese process. The blade is.. The Blood Dragon Katana sword is made of folded and clay tempered steel with a polish.. This is a very unique ninja sword design, the blade is made of blackened folded steel with a saw-too.. 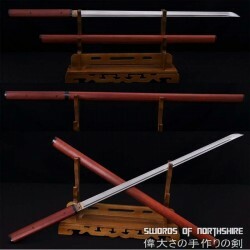 This is a well-made colorful folded steel sword set, following the traditional Japanese process. The.. 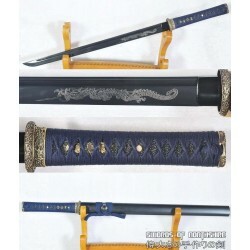 The Gold Wave Katana sword is made of folded and clay tempered steel with a polished mirro.. This is a well-made folded steel Chinese sword, following the traditional forging process. The blade.. 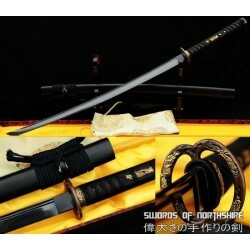 This is a well-made folded steel samurai sword set, following the traditional Japanese process. The .. 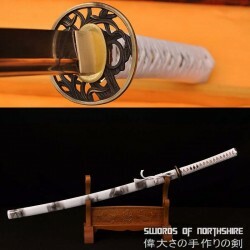 This is a well-made folded steel Katana, following the traditional Japanese process, made to look ju..
Swords of Northshire is proud to offer free wordwide shipping for all of our products. Shipping times vary based on location and customization. If for any reason you're not happy with your purchase, we're here to make it right. We can exchange or refund any purchase that doesn't meet expectations. At Swords of Northshire, we back our products 100%. We work with only most trusted forges to create completely custom swords for you.